I had the honor of sharing an author table at the Loveland Public Library Local Author Showcase with a delightful, adorable, sweetheart. Her name was Pat, and she was 90 years old. She self-published her first book, Missing Pieces, A Memoir, this year, 2017, and was immediately offered a book deal by a traditional publisher, PLUS, they want a sequel. We only had a half hour to visit because her grandson called her, and since she had not heard from him in eight years, and he just graduated with a Ph.D. in physics, she was not about to ask him to call back. She had no qualm with her priorities. Pat grew up in Hill City, KS, and even though she has extensive education and awards such as one of the Outstanding People in New Jersey, and New Jersey’s School Social Worker of the Year, she has no memory of her childhood or going to school. She just remembers feeling dumb. 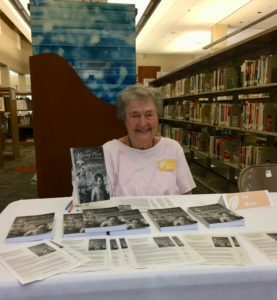 She didn’t understand her void of childhood memory, so after retiring in Princeton, NJ at the age of seventy, with encouragement from her family, she decided she was going to uncover her past by writing. For twenty years she interviewed family members and analyzed family history. Her findings are in Missing Pieces. She said her sequel explains the process she went through to find her truth so others too can recover memories lost. She knows her mother didn’t want another baby, and she knows she was dyslexic, but she had not put the pieces together. She doesn’t know how she got through graduate school, but Pat knows she lived her whole life faking it. She said, “I was a fake, now, I’m me.” More importantly, she doesn’t feel dumb. Her husband, who died at the age of thirty-three from an aortic aneurysm, leaving her with three small children, taught her to read. He was a history buff and brought books home on the topics of countries and cultures. He made reading exciting and never made her feel dumb. Today she is an avid reader and is a regular library patron. Her sweet smile was priceless. I hope you enjoyed Pat’s short story as recalled by my conversation with her. Her book is available on Amazon. This is an absolute awesome story! I must make note of the title of her book/s and put on my ‘to read’ list. Lois, I bought her book but I have yet to read it. I look forward to the snowy day tomorrow when I can hunker down with and enjoy her book. She was amazing!